It’s Thursday morning at a Chick-fil-A restaurant outside of Dallas, and a familiar group is settling in to their usual seats, ready for the shouting of letters and numbers that’s about to fill the air for the next hour. A woman known affectionately in the restaurant as “Miss Ruby” glances down at her card to see if she has the right number, then looks to her right, carefully checking a card in front of an empty chair. That card’s owner is still in the playground running out his early-morning energy. It’s bingo day in Waxachachie, Texas. The tradition is a decade-old and has been the site of weekly winnings, food and conversation for dozens of regulars like the 91-year-old champion, “Miss Ruby” Hayes. 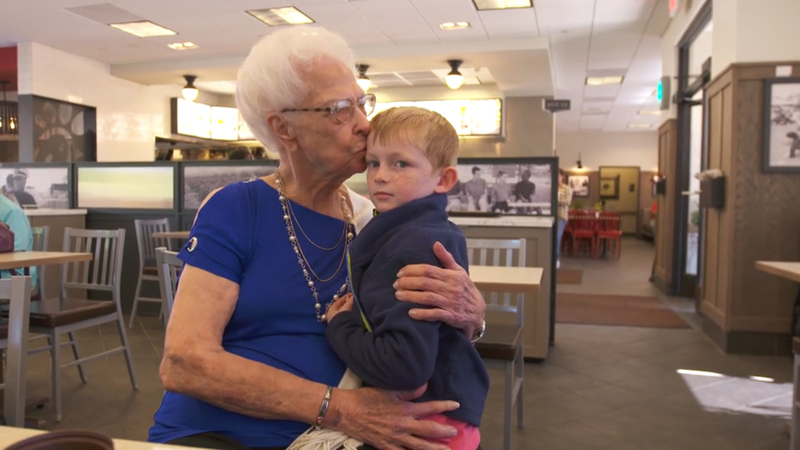 She usually sits at a table near the middle of the restaurant with a small coffee, a chicken biscuit and her long-time friends Margaret and Helen. Hayes keeps a busy schedule, (“I have to be busy or I could go crazy,” she says) spending Mondays at the local hospital thrift store, Tuesdays at the beauty shop and Fridays at the senior center. 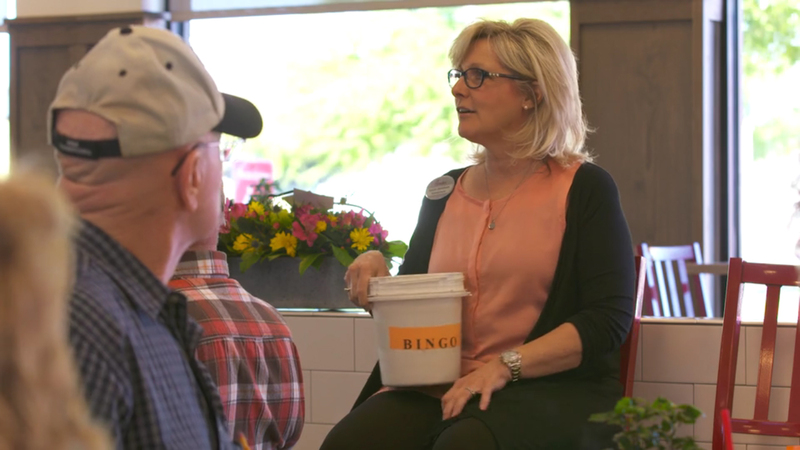 But Thursdays are her favorite – the day for bingo and for a special friendship that’s become the talk of the dining room. “I was just marking my bingo card when the sweetest little face popped up out of nowhere,” says Hayes, “He asked, ‘Can I play too?’ and I said, ‘Of course!’"
That was one year ago, when Hayes met a new friend -- Brenden Robinson, a six-year-old boy with reddish hair and a warm smile. “He’s just the sweetest little fellow,” says Hayes. On Hayes’ birthday and Valentine’s Day, Brenden and his mom brought her flowers. Hayes beams when she remembers the other small presents he’s given her, like when Brenden won a round of bingo and picked a prize from the table for her. “I told him no, go back and get something for yourself or your mother,” she says. 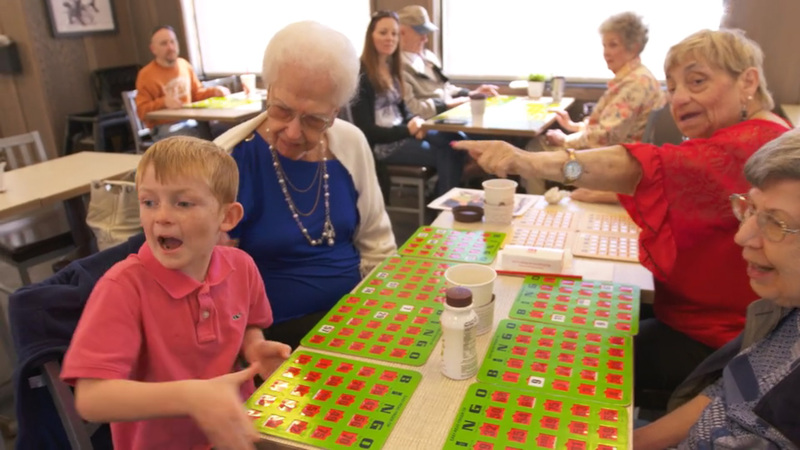 Back at this Thursday’s bingo game, Brenden gets more and more excited, nudging Hayes and pointing to his card. He’s one square away. He proudly walks up to the table in the middle of the restaurant and has his pick of prizes. He chooses a book and returns to show it to Hayes, his eyes smiling. Hayes gives him a big hug before he leaves his prize at the table and returns to the playground. Michel Harding remembers waking up on March 1 feeling nervous and excited. Both emotions were justified as he was about to start a new career. Committed, focused and determined – these are all traits that perfectly describe Matthew Nunez and his relentless pursuit of his dreams, despite the challenges he has had to endure.